Vince McMahon steps out of a limo. Then he struts. Braun Strowman heads to the ring. Strowman says that Lesnar has always been afraid of him. Strowman says that with Corbin out of power, there is no one left to save Lesnar. At the Royal Rumble, Brock Lesnar will get Strowman’s hands. Baron Corbin comes out to the stage. Baron Corbin starts a “you got fired” chant. Corbin doesn’t care what the people say. 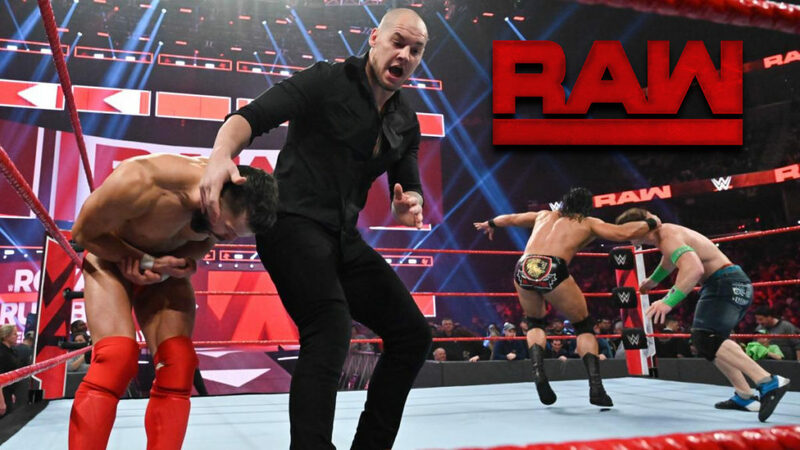 Corbin calls Strowman a liar. Strowman won’t win the title. But Corbin thinks he’ll win the title after he wins the Royal Rumble. Having heard enough, Strowman chases Corbin to the backstage area. Strowman hunts for Corbin (and attacks Sunil Singh along the way). Strowman walks off, but he comes back when he hears Elias singing. In song, Elias informs Strowman that Corbin is hiding in Vince McMahon’s limo. Strowman pulls the driver out of the limo before ripping one of the doors off of. Corbin runs away, but Vince McMahon has returned. Vince is furious. With Vince McMahon watching, Strowman attempts (and fails) to put the limo door back on. Vince is still angry. He tells Strowman that his actions will cost him $100,000. Strowman says the limo isn’t worth that much, so Vince decides to cancel Strowman’s title match at the Royal Rumble as punishment. Vince walks away. Strowman flips the limo, screams, and walks away. Braun Strowman is escorted out of the building by security. Baron Corbin thinks it’s funny. Good match. I think it was pretty interesting. Ronda did some stuff, but the main focus was definitely Sasha Banks. Sasha got isolated for a while, but rather than tag Ronda in late in the match, Sasha was able to mount a comeback all by herself. This was, of course, to put over Sasha Banks’ ability and the Bank Statement, but it was still pretty fun to watch. In the ring, Charly Caruso comments that Rousey and Banks were able to trust each other tonight. Rousey says she trusts and respects Banks, and it will be an honor to face her at Royal Rumble. Sasha Banks takes offense that Rousey seems to think it’s a foregone conclusion that she’ll win. Banks tells Rousey that she better get used to not getting everything she wants anymore when Banks defeats her. Sasha Banks leaves the ring. Rousey chases her and tries to explain herself, but Banks doesn’t want to hear any of it. Banks walks away again. There is a line forming outside of Vince McMahon’s office. Apparently a lot of people want to talk to him. Vince’s door opens, and out steps Jerry “The King” Lawler. Lawler smiles, but he quickly becomes confused when No Way Jose and the conga line dance past him. Sasha Banks and Ronda Rousey are yelling at each other. They’re being held apart by Bayley and Natalya. Sasha and Ronda walk away, but Bayley and Natalya begin arguing about who started their fight. The Riott Squad walks up to make a bad situation worse. They tell Bayley and Natalya to find a friend and face them in a match tonight. Natalya accepts the challenge. Lucha House Party heads to the ring. The Revival comes out next, and they are upset with Lucha House Party. The Revival says that LHP turned their backs on them when they saw Dawson’s foot on the rope last week but did nothing to try to get the referee’s attention. There is a price to pay for turning your back on The Revival. Good match. This was pretty much just constant action. Unfortunately, most of the match was seen with a picture-in-picture of the backstage are where Dasha Fuentes was talking with people wanting to face Brock Lesnar. Nothing against the segment, it was fine (and we saw EC3), but it very much distracted from the match. Regardless, both teams looked great, and the finish was good for story purposes and for the match itself. Dasha Fuentes tries to get a word from Vince McMahon. Vince gives no word except that he’s heading to the ring. Vince McMahon heads to the ring. As he begins to speak, John Cena’s music interrupts him. Cena heads to the ring. Cena says he knows what Vince is going to say. He’s going to say that he lost his Universal Title match, and now he’s going to ask someone to step up. Cena has done that before, and he didn’t let Vince down. Cena continued to step up time after time. He made WWE his life, and he loved every second of it. Cena asks Vince for another chance to step up. He knows he’ll win, because he has ruthless aggression. Drew McIntyre stops everything as he heads to the ring. McIntyre doesn’t care about most of what Cena says, but how dare Cena say he still has ruthless aggression? McIntyre is what ruthless aggression looks like now. Cena’s time is over, but McIntyre’s time is now. McIntyre tells Cena that he can leave. Baron Corbin heads to the ring. Corbin says his life was threatened earlier tonight. He’s not the type of person to get a lawyer involved, but he think Vince would agree that it’s in everyone’s best interest to give Corbin the title shot. Finn Balor heads to the ring. He’s tired of being left out of these conversations. After all, he’s the only person in the ring right now who has been Universal Champ. Vince says there’s a lot of beef in the ring. He tells Balor that he’s good, but Lesnar is huge. Vince isn’t sure that Balor can beat Lesnar. Balor knows that Vince has never believed in him, so he decides to show Vince. Balor attacks Corbin, and a brawl breaks out. Drew McIntyre ends up being the last man standing. Vince likes what he’s seeing. He decides to make a fatal four way to decide who will face Brock Lesnar at Royal Rumble. Jinder Mahal is honored to be in the presence of Vince McMahon, but he’s a little offended that he wasn’t considered to replace Braun Strowman. Mahal wants one opportunity to prove himself. Vince tells Mahal that he can choose one man from the fatal four way, and if Mahal wins, he’ll take that man’s place. This was a lot of fun. The surprise addition of Nikki Cross had me smiling throughout the entire match. The Riott Squad didn’t have quite the teamwork that they usually do (because Nikki was causing too much chaos), so the inevitable loss by The Riott Squad didn’t bug me as much as all the other losses. Finn Balor walks in the back. He sees Lacey Evans talking with Dana Brooke and Mickie James, then he continues walking. Dean Ambrose thinks it’s wrong that he has to defend his title tonight in a triple threat match. It’s also wrong that he has to do that in Memphis. Regardless, no one is going to take away his IC Title. Good match. Mahal attacked Balor before the match, and Balor was selling it hard. That set up Mahal to dominate early and for Balor to mount a comeback. It was fun to watch, and, of course, it showed Finn Balor’s durability and heart. It also set up Balor for a disadvantage going into the fatla four way match later tonight. Lio Rush understand that in order to step up, sometimes you have to step over. Bobby Lashley is a fighter, and he’s going to become champ whether anyone likes it or not. Charly Caruso welcomes Seth Rollins. Rollins says this might be his last chance challenging for the IC Title, so he’s going to make the most of this opportunity. Good match. It started with people pairing off in all combinations and attacking each other two on one. From there, it progressed to where everyone was just starting to look out for themselves. Lio Rush started to make his presence known at this time, and Rush became heavily involved before the match was over. I liked this. Adding Lashley was an interesting wrench to throw into the Rollins/Ambrose feud, and this match in particular will cause even bigger waves. It will be interesting to see where it goes from here. Alexa Bliss’ assistant knocks on her dressing room door, but there is no answer. He has her coffee, so he knocks again as he enters her room. Bliss is standing about three feet from the door, wearing no shirt (but covering herself with something). She seems mildly annoyed and tells her assistant to leave. He does. Alexa Bliss comes out to the stage for A Moment of Bliss. Alexa reveals that there will be an Elimination Chamber match to determine the first women’s tag champs. She also reveals the title belts themselves. She then introduces her guest tonight, Paul Heyman, but Paul would rather introduce himself. So he does. Once Paul takes a seat, Alexa asks him what he’s feeling now that Braun Strowman is not going to face Lesnar at the Royal Rumble. Paul says that regardless of who Lesnar faces, he will still walk out of the Royal Rumble as champ. Paul goes on to talk about Lesnar’s four potential opponents. As Heyman talks, Otis Dozovic wanders onto the stage. He shakes and says some stuff for a while before Tucker Knight rushes out to try to get him to get off the stage. Adam Pearce and Dan Engler also come out, and Dozovic finally goes backstage. Bliss and Heyman look confused. They stand there in silence as the ring announcer begins to announce the main event. Good match. The match kind of quickly turned into a lot of one on one scenarios, but there were a lot of quick changes later in the match. It built up to a nice climax, and I was happy with the match. After the match, John Cena tells Finn Balor that he believes in him. Cena then raises Balor’s hand. Cena leaves as Balor celebrates. This was mostly a good show. Strowman destroying another automobile doesn’t really entertain me, but throwing him out of the Universal Title match makes things kind of interesting. It also made for a memorable night for Finn Balor. I also liked the IC Title stuff. Adding Lashley to the mix feels sudden (unless I missed it, they never even talked about why Lashley and Rollins were brawling so much last week), but I’m okay with it. Seeing Lio Rush become what was essentially the fourth man in that triple threat was fun. I like the announcement about the women’s tag titles, though A Moment of Bliss isn’t blowing me away so far. Seeing Otis was fun, but there was no punchline to Alexa’s show. It just stopped, and that was it. Also, as you can probably tell from what I wrote above, I’m not a fan of Alexa’s backstage moment. Is that kind of thing really necessary? What’s the point? I like that we’re finally starting to see some of the NXT people. Seeing Nikki Cross was great, even if her presence did mean that the Riott Squad was sure to lose tonight. I also like that Banks and Rousey are starting to not get along very well. I think that will be a good match. This was good. I think it topped the main event for me mostly because it felt like it had more structure to it. Plus, Lio Rush helped make things very interesting.